This picture, taken during my lifetime, continues to baffle me. I am looking for the final four pieces in the puzzle. I can date the picture by the oldest and youngest. Edward Daniel Ryan died at Christmas 1950 and the infant is Jacqueline Green, born October 1949, making this warm weather after May 1950. From the background I would guess it was taken at Emagene Veech Green’s home in the country between Mt. Pulaski and Illiopolis. There are 19 relatives in this picture. I identified 13. Emagene Green was able to identify two more. That leaves four we don’t know and yet we know they are almost undoubtedly descendants of Benjamin B. and Sarah Lucas Wood or the spouse of a descendant. Back row, Irma Mae Ryan Sapp, Margaret Ryan Rentchler Graul, Janet Downing Rubin, Thelma Volle Downing, Vera Brown Downing, Ethel Ryan Downing, no clue, no clue, Bessie Wood Meade, Cora Ryan Lipp, no clue, Marie Wood Havener Heard, Mary Ryan Veech. 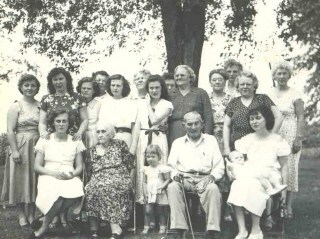 Front row, Betty Downing Rothwell Atwood, Lillie Wood Ryan, no clue, Edward Daniel Ryan, Emagene Veech Green, Jacqueline Green Kapper. I’m sure the two younger women in the front row got to sit because Emagene was holding a baby and Betty had had one in May. Cora, Ethel, Mary and Margaret are among the 10 children of Lillie and Edward Ryan. The unknowns are not from their families. Bessie and Marie are daughters of Lillie’s brother Caleb Wood and his wife Marcy Conaway. The unknowns may be connected to them. And, I wonder, where are the men and the rest of the children. Without a doubt I was there. If you know the answer to this puzzle PLEASE let me know. I have a copy of Evidence Explained which I bought when it came out in pdf. I have it on my computer for instant reference. I have copies of various other publications, either purchased, free online or that I bought and then scanned. It IS handy to have some of these reference books at your fingertips. Have you thought about one of those reading devices that allows you read a book without a book? Most allow you to download a book instantly. Say you are researching at a library and realize you really need the census guide you saw at [chose your favorite retailer]. With one of these devices you can get it right now. The device may also read pdf and other formats that you may already own. Those devices are nice but they are also pricey and are just one more piece of equipment to carry around. Did you know you can download the app for those devices to your computer, laptop, netbook, iPad, even your smartphone? Did I mention the apps are all free? You could download them ALL to your laptop. Whether you chose one or all you can have the books – and access to more – but save money by using equipment you already have. What devices you can use them with and what they can do varies as do the procedures and requirements. You can generally share between devices. With Amazon’s Kindle, for example, you can read the book on your netbook at the library, make notes, then pick up where you left off – including the notes – at home on your desktop, then on your smartphone later. Here are links to the three most popular readers.